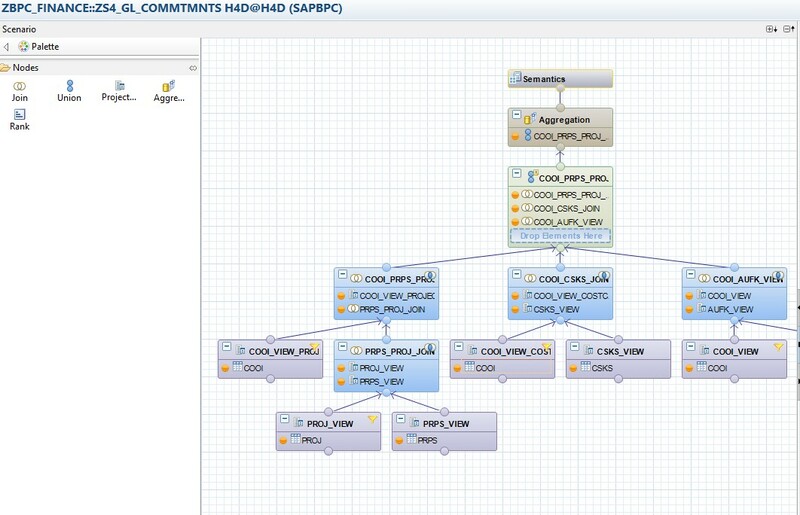 With the release of the AS ABAP 7.4 many new capabilities were introduced, one of them is the AMDP methodology. This methodology is transformational as developers can leverage the best of both ABAP and SQL programming language to build models and applications. SAP BW on HANA, S/4 HANA embedded BW and BW/4 HANA can also take benefit from this framework. Traditionally, BW developers process the BEx variable processing through Customer Exit within the ABAP layer; with the introduction of HANA Exit, the Customer Exit Variable can be processed in HANA layer (Code Push-down). Please follow the step-by-step process illustrated below to achieve the same. Version: Manual Input Entry – Single Value – Mandatory. 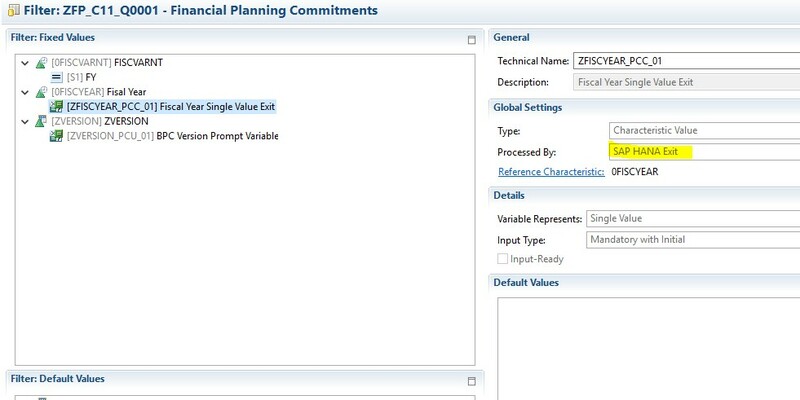 Fiscal Year: HANA Customer Exit – Single Value –Mandatory initial. 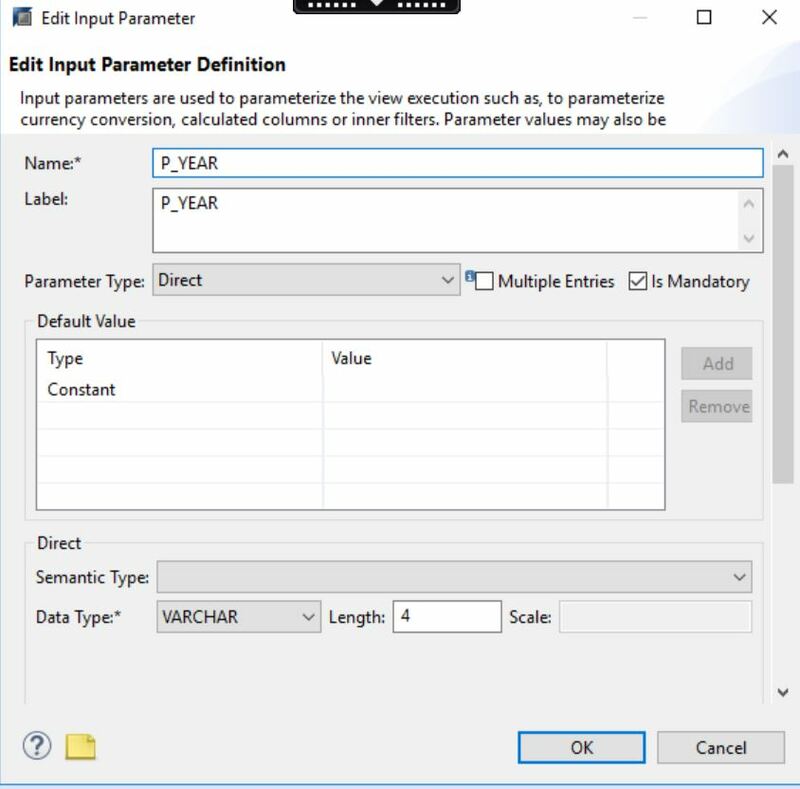 The Filter Parameter defined is Single Value, this filter value will be passed from BEx variable into the Calculation View for filtering the records based on the Fiscal Year value. Variable that needs to be processed is “ZFISCYEAR_PCC_01”, the c_ts_vnam_index is the temporary/internal table to hold all the relevant variables and their values for further processing of “ZFISCYEAR_PCC_01” in the IF_RSROA_VAR_HANA_EXIT~PROCESS method. Here, I_VAR_VALUE_1 is index 1 record, I_VAR_VALUE_2 is index 2 record and so on.This value in I_VAR_VALUE_2 will be passed to the where condition in the IF_RSROA_VAR_HANA_EXIT~PROCESS method. 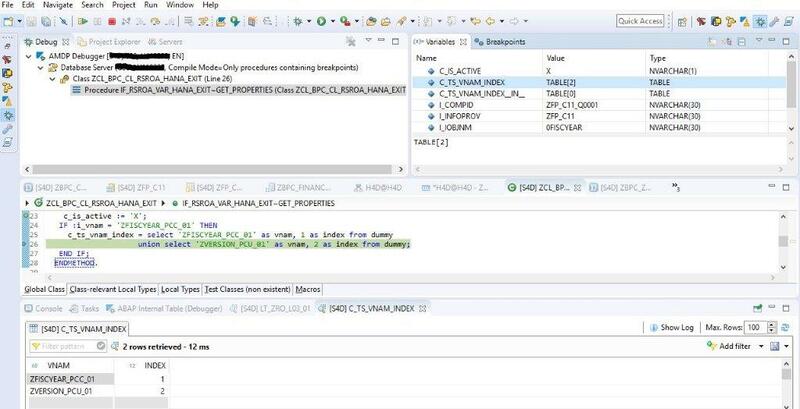 In this method, we are selecting the first fiscal year value from the master data of the selected Version on the prompt selection screen( attached above -Prompt Screen). 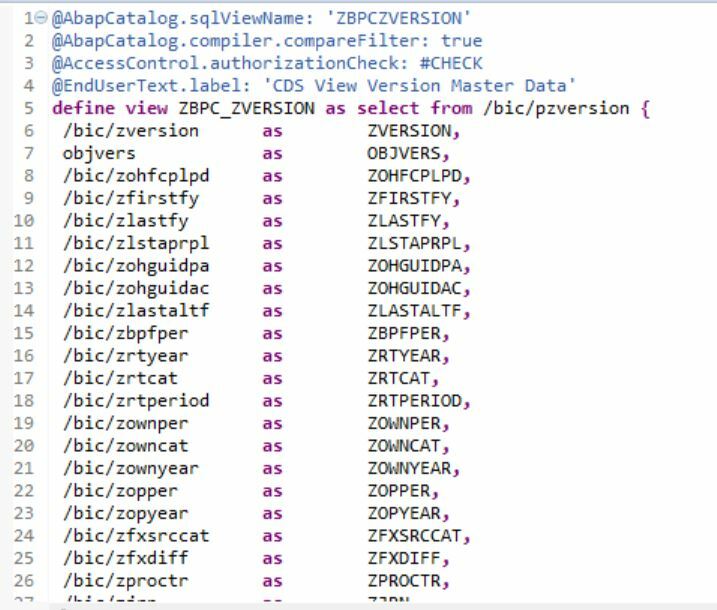 Also, the AMDP method is exposing the master data view on Version (this is a CDS-view on Version Master Data) after the Using statement. 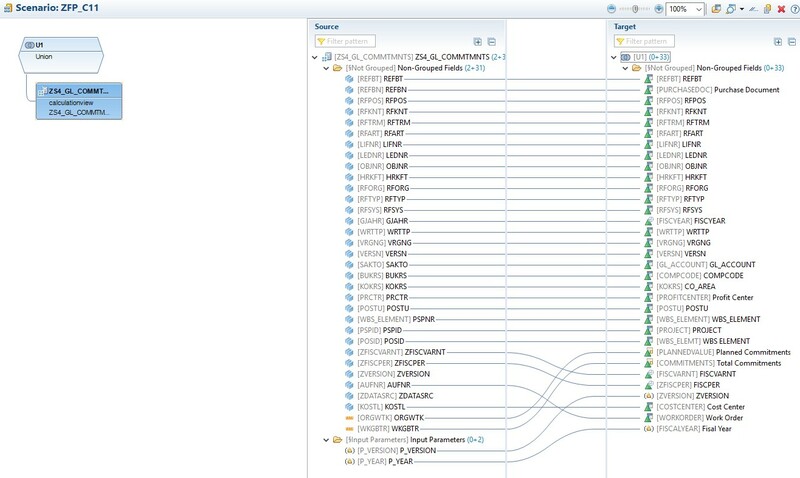 One can also directly refer the P-table of the Version Master Data or any ABAP tables/Views. Debug-mode : I_VAR_VALUE_2 is populated based on the Version manual input variable. Currently there is no concept of I_STEP in this exit processing. If the variable is input-enabled, the SAP HANA exit procedure is called exactly once before the variable screen. The variable is then automatically given the default values of the other variables in the procedure. If the variable is not input-enabled, the SAP HANA exit procedure is called exactly once after the variable screen. The variable is then given the values from the variable screen in the procedure. The system can contain no more than one BADI implementation with the value ‘X for the query/variable name combination. Hope the above illustrated example will help developers in implementing the same. could you please tell if the CDS for MD has already been there or if you have created it? also, if there are no I_STEPS and IO filtering, does it check processing for all of the IO’s/Variables? so far as I understood there is no option to modify customer input, would that be correct? would you be so kind and elaborate a bit on the last point? what does the c_is_active ‘X’ do? 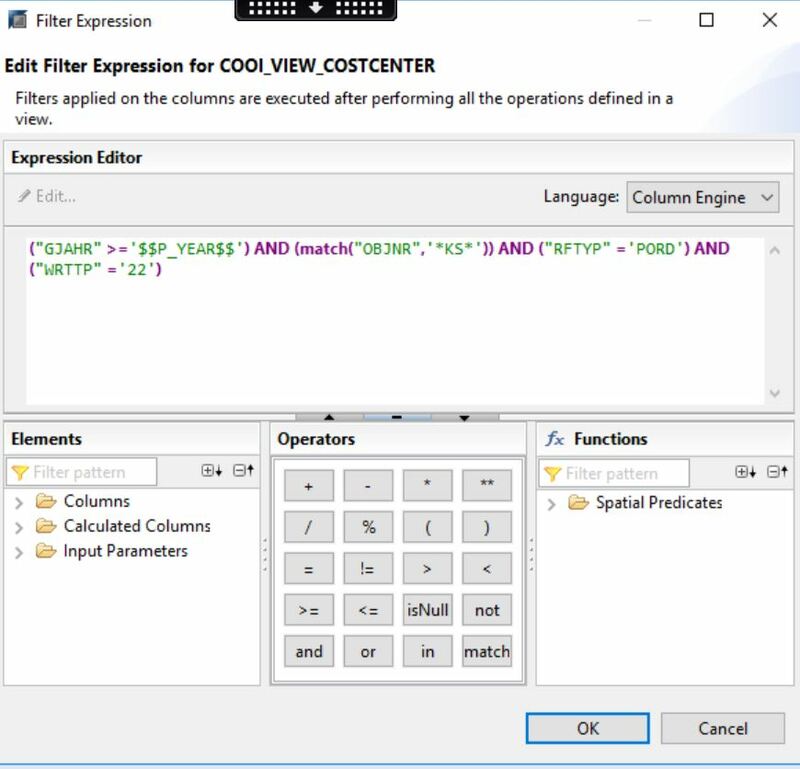 The underlying data view was a calc view , what would be the case when I have an ADSO ? Would I use the calc view auto generated by the ADSO ?